We've written a lot about how social media and video together makes for a powerful combination. Now let's take a look at a cool new implementation from PAID Inc. PAID Inc. used the Brightcove platform to incorporate Twitter with video on their latest campaign for Aerosmith drummer Joey Kramer. PAID Inc. is a brand management consultancy covering everything from merchandise to video production, web development and social media marketing for celebrity clients. They built a SWF to include Twitter streams based on #hashtags and @accounts to crawl across the bottom of the screen. The Twitter player is featured on both on Joey Kramer's own website and on Aero Force One, the official Aerosmith fan community website. This campaign lined up with Joey's book signing appearance at South by Southwest (SXSW) promoting his new memoir: Hit Hard: A Story of Hitting Rock Bottom at the Top. SXSW was the perfect venue to promote this effort, where music, film, and technology come together in one big conference. 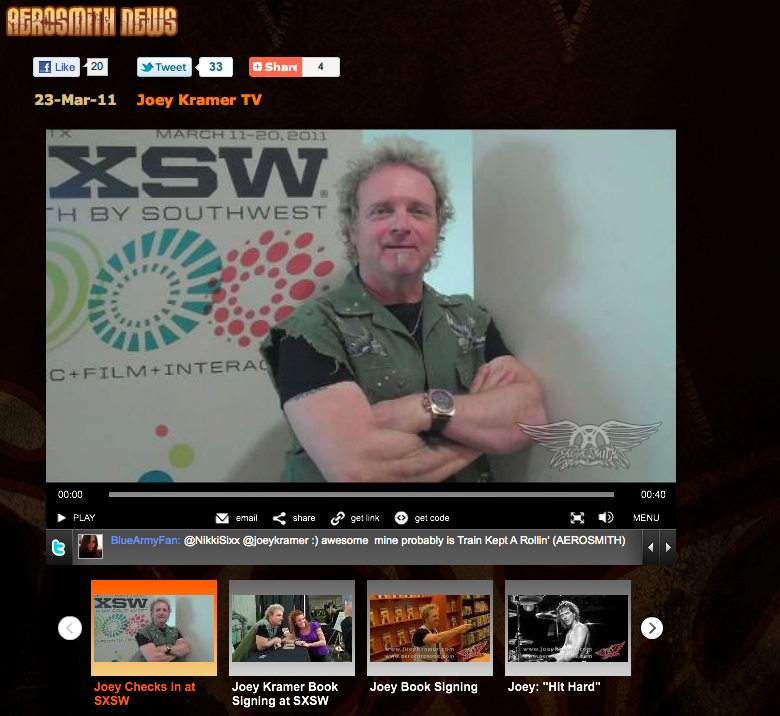 Joey Kramer took the opportunity in the video to encourage fans to engage with the player: "Remember to tweet me @JoeyKramer so you can see your messages scrolling across the bottom of the screen." This is a great example of how producers can match the video content to what's outside the box to break the four walls of the player and encourage fan participation. PAID built this SWF and has since made it available to other Brightcove customers on Open Source @ Brightcove. 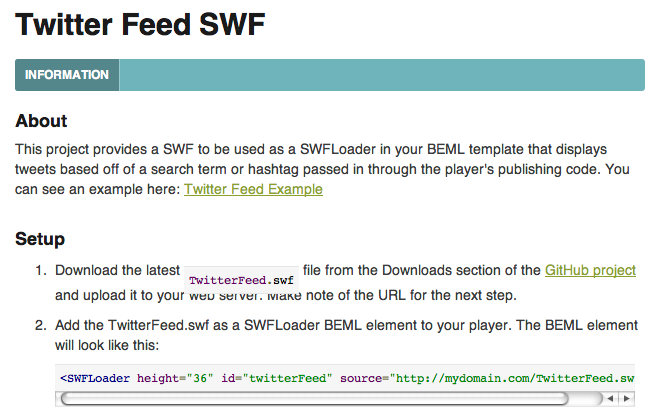 You can download the TwitterFeed.swf and include it in your own custom BEML, with customized search terms, @ or #hashtag cues. For more ideas about and inspiration on making social media and video work together, check out our how-to guide on video and social media: Like, Link, Share, Tweet.